For a number of year’s now, ‘ the ultimate driving machine ‘ has been available as an SUV, a shape & size of car that one would not necessarily associate with exciting driving. BMW being BMW though, have tried to stay faithful to this company statement & despite the original X3 not actually being that wonderful, I had high hopes for the second generation model which arrived at CC&V Towers recently. In a glut of mid-range cross-overs, the X3 offers all that you could want of a five-seat family car. From the outside it’s unmistakably a BMW, with the kidney front grille, sweeping side lines & high rear end. Inside, the cabin is beautifully apportioned, with high quality fixtures & fittings throughout. The familiar BMW dashboard & infotainment system is in place as is the option of altering the vehicles drive ability, something that BMW know a thing or two about. Our test model was the BMW X3 xDrive 2.0d M Sport. Powered by a 2.0litre 190hp diesel engine, this version has some guts, with the eight-speed automatic gearbox happy to oblige when required. Comfortable on the motorway, refined at low speeds & capable of overtaking slow moving traffic at a canter, the X3 should make anyone who has one a very happy driver indeed. But, if you want a family car, capable of carting you & your’s around the local neighbourhood, the X3 will perform this task admirably. Both front seat passengers get acres of head & leg room & even in the rear, taller passengers will be comfortable, even in the usually pokey centre rear seat. The cabin has been designed with plenty of storage options too. Decent sized drinks holders in each door, a centre binnacle lift-up arm rest with a USB connection inside, a useful glove box & space in front of the gear lever offer more space for your keys, iPhone or wallet. The boot is generous, coming as it does with 550 litres of space with all five seats in place, which increases to 1600 litres if the rear bench is folded down, a task easily accomplished if required. 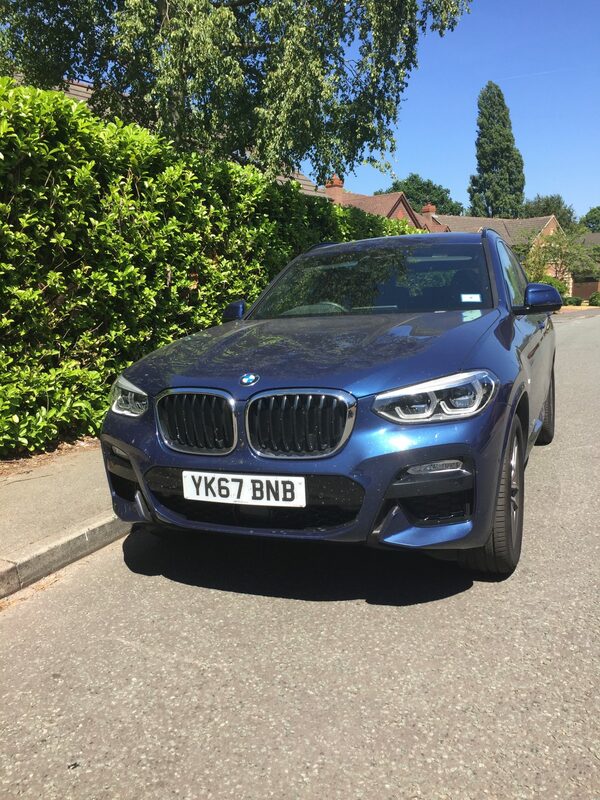 Whilst we have driven many of the X3’s competitors recently, a week in the X3 proves that this BMW still shines in the sector thanks to it’s excellent drivability & handling. 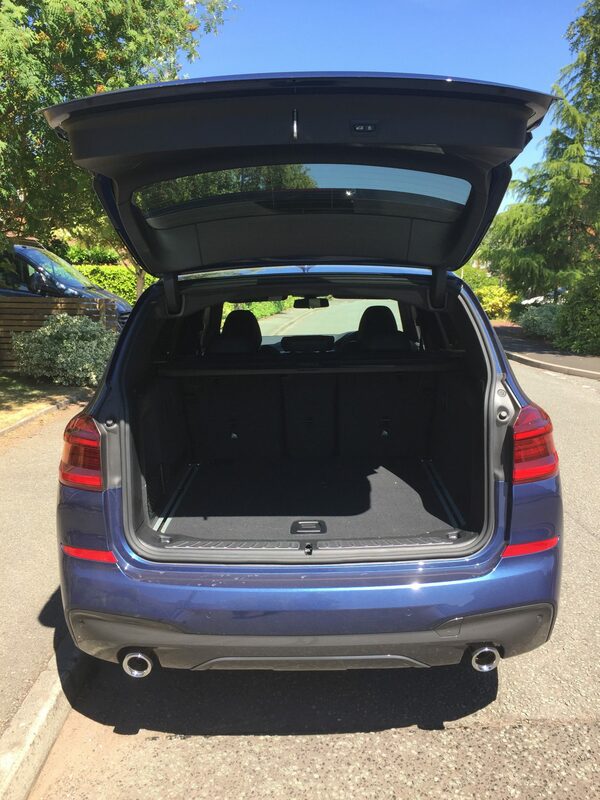 It may look like an SUV, but underneath, the X3 is built on a platform shared with the 5 Series saloon, so the X3 can be bought or leased in the knowledge that it will be fun to drive. Features include xDrive 4WD as standard & in line with the BMW range there’s both petrol & diesel engines that should keep all company car confusniks happy. The range is also fitted with the latest ‘autonomous’ safety aids & up to date tech, but, as our test car showed, not all of these come as standard & will cost you a little bit extra. For example, ‘Active Cruise Control with Stop & Go’ adds £620 to your purchase. 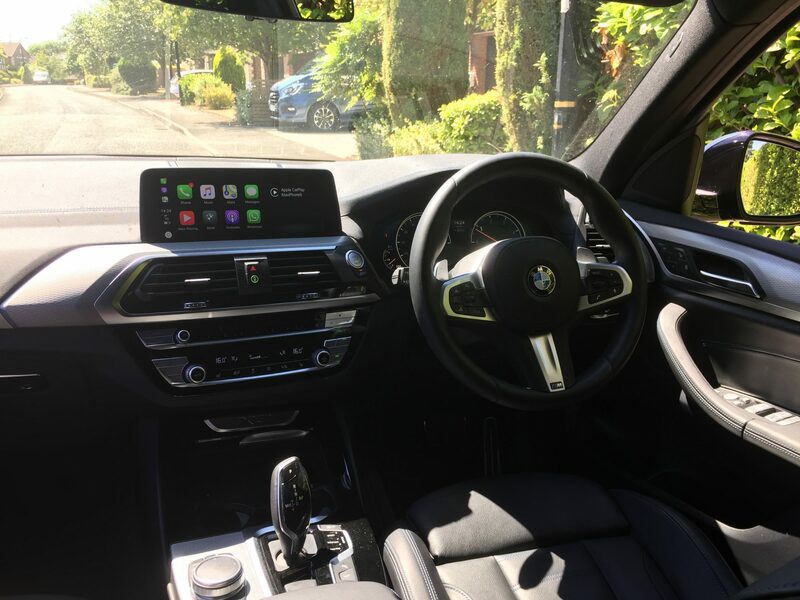 The Technology Pack fitted to my test car includes a Display Key, Head up Display, Enhanced Bluetooth with Wireless Charging, BMW Gesture Control- a source of endless fun for my 17 year old son – a Digital Cockpit & WiFi Hotspot preparation which costs an additional £1545, which is not small change. So, we have a refined, comfortable people carrier, that features up to date safety & tech. But, the $64000 dollar question is , what is it really like to drive ? I’m pleased to report that the answer is well, very well in fact. The latest BMW X3 offers both comfort & finesse & the driving experience that BMW claims is definitely there too. Our 2.0 litre diesel was excellent, quiet & refined even under duress. The chassis feels light & makes the car feel nimble, especially when driven hard around corners & there’s the added plus of little or no body roll. Where most of it’s competitors fail when pushed under similar circumstance, the X3 pulls it’s sleeves up & gets stuck in. It really does feel like a higher driving 5 Series, offering up a really comfortable ride on it’s 19″ alloys. What will company car drivers get in the way of penalties by running an X3 ? The smallest 2.0-litre diesel returns a combined test result of 53.3mpg, with CO2 emissions of 140g/km. The 3.0-litre diesel manages a test figure of 48.7mpg with 154g/km. The 2.0-litre petrol offers 38.7mpg with 163g/km, while the racy X3 M40i will theoretically, but not with me driving it, do 34.4mpg, producing 188g/km of C02. As rough guide, I averaged 36.2mpg in my week & almost 500 miles in the X3. I mostly used the Eco Pro drive function which was fine for the motorway, selecting Comfort & Sport in town & when driving on winding b roads. Many of these cars will be bought by companies for their employees, and the Benefit-in-Kind tax brackets are 33 per cent for the 2.0-litre diesel, and 35 or 36 per cent for 3.0-litre diesel depending on model. The 2.0-litre petrol X3 gets a 33 or 34 per cent rating – again dependent on model – while the M40i will be taxed at top-rate 37%. While the X3 officially starts at around £39,000, most buyers will choose a model costing £40,000 or more. Our test model cost was £41,070 but add the extras as our test car did & the final cost is £49,205. 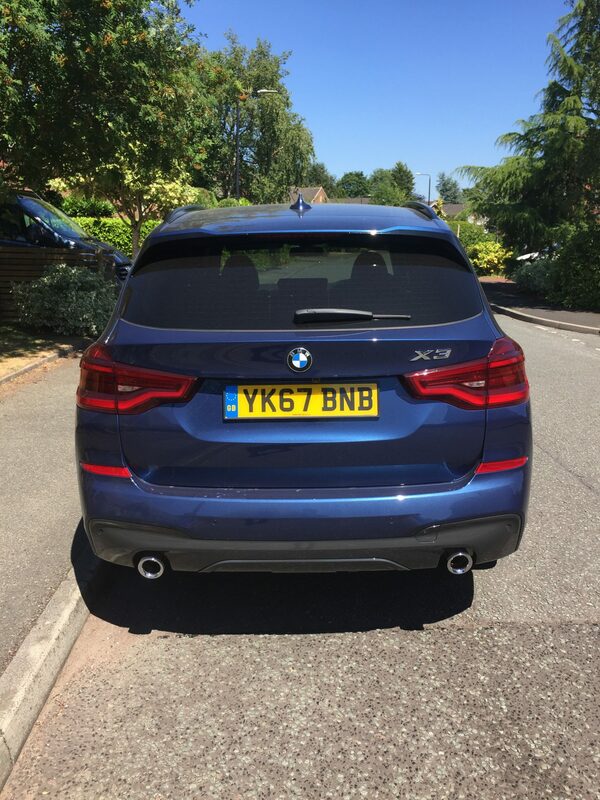 When you go over 40K VED (road tax) will shoot up from £140 annually to £450 from years two to six of the X3’s life – an additional total cost of £1,550. So think long & hard before you lease. 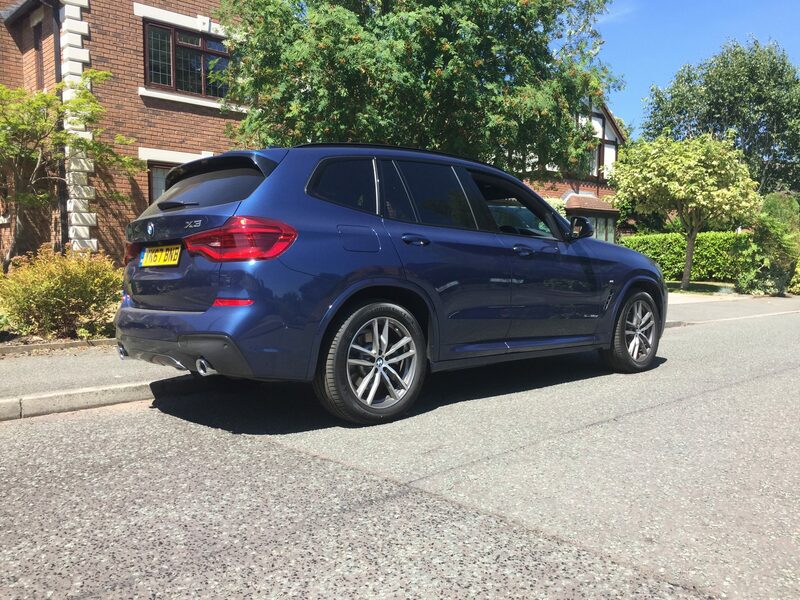 As I write this in June 2018, you can lease the BMW X3 xDrive20d M Sport from £429 per monthly rental, (plus £2,574 initial rental), so this will give you an idea of if an X3 fits into your monthly outlay. One thing is for sure, given the competition, for me the X3 is still the best car in it’s sector to drive & can be described as the ultimate driving SUV.